Several mining districts surrounding the central Colorado Sawatch Range contain economic deposits hosted by late Mississippian paleokarst features. These are primarily developed in and along the upper surface of the early Mississippian Leadville Formation. Paleokarst features include isolated eaves and sinkholes as well as integrated cavern systems that are mineralized and can be traced from insurgence to outlet. This paper will focus on two areas of the Leadville, Colorado mining district, the historic portion, and the Sherman Mine where base-metal silver deposits follow paleo solution features. Integrated paleokarst cave systems are present in both areas. The Sawatch Range is located in central Colorado, approximately 96 mi (150 km) southwest of Denver, Colorado and a short distance west of the convention site at Salida, Colorado. Figure 1 shows the outline of the present day Sawatch Range, the outcrop of the Cambrian through Mississippian strata surrounding the range, and the location of several mining districts, including Leadville. As can be seen from the figure, the Sawatch is a doubly plunging anticlinal structure elongated roughly north-south, with an east-west width of approximately 40 mi (65 Ian). Leadville is located along the eastern flank, at 10,150 ft (3,080 m) along the western side of the Mosquito range. Although the Leadville district is the focus of this paper, several other mining districts in the Sawatch Range including Aspen [Maslyn, 19761 and Gilman [Radabaugh, et al, 19681 and [Posada, 1973] as well as at the Pitch Mine [Dupree, 1979] and a short distance south, the Orient Mine [Balleweg, 19901 contain paleokarst features hosting economic mineral deposits. Base-metal silver has been produced at the first three sites, with uranium production at the Pitch Mine and iron ore at the Orient Mine. Figure 1. Generalized geologic map of the Sawatch Range. Paleozoic sedimentary rocks, including the Leadville Formation are shown as the dark gray ring surrounding the Precambrian core of the range. Leadville is located along the east flank of the range near the center of the diagram. From [Beaty, et al, 1990], [Tweto, et al, 1978], and [Bryant, et al, 1981]. Luiszer [19961 provides a generalized stratigraphic column for the Sawatch Range area. Unconformably overlying the 1.4 Ga Precambrian Kevin Granite Batholith, the sedimentary sequence begins with the Cambrian Sawatch Quartzite, a brown, red and white transgressive deposit. Gradationally overlying the Sawatch Quartzite is Cambrian Peerless Shale, a sandy unit that is unconforrnably overlain in turn by the light grey color Ordovician Manitou Dolomite. The latter is a major host of cavern development in the Williams Canyon area near Manitou Springs, Colorado, the type section. Included in the generalized stratigraphic section, but missing in the Leadville area are the Ordovician Fremont Dolomite and underlying Harding Quartzite. The lowermost member is the Gilman Sand, a mixed assemblage of sand and thin dolomite. This unit may be observed in parts of the Cave of the Winds near Manitou Springs. In the cliffs of Williams Canyon the Gilman Sand is a slope former. The type section is at the mining town of Gilman, a short distance north of Leadville. Above the Gilman Sand is the Redcliff Member, a thin bedded dolomite. The type section is near the town of Redeliff, in the vicinity of Gilman, north of Leadville. The upper surface of the Redcliff Member is a marked unconformity with local cave development and limestone breecia. The uppermost unit of the Leadville is the Castle Butte Member. This massive cliff forming unit, where limestone, is the host for most of the cavern development on the White River Plateau and other areas of Colorado. The type section is located at Castle Butte, a few miles south of Aspen, Colorado. Castle Butte is prominent knob exposed at the edge of paleokarst sinkhole that was first described by Maslyn . 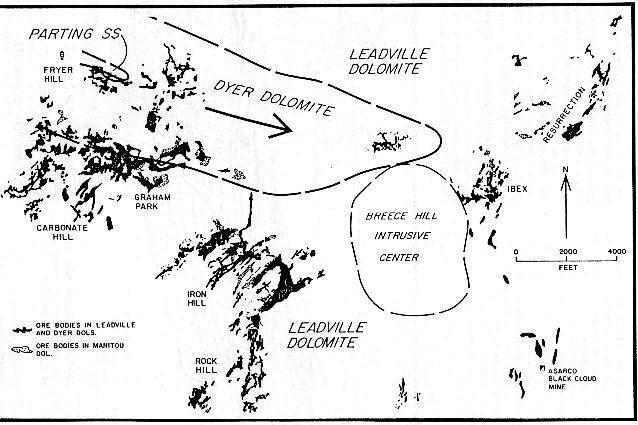 A note on nomenclature: the uppermost unit of the Leadville can be either a limestone or a dolomite. In the Aspen area, the Castle Butte Member is a limestone and the formation is commonly referred to as the Leadville Limestone. In most of the mineralized areas of the Sawatch Range, including Leadville however, the Castle Butte Member is a dolomite and the formation is commonly referred to as the Leadville Dolomite. For a more detailed discussion of the Leadville Dolomite in the Leadville area, the reader is referred to Dorward . Regionally, the Leadville district is located along the east flank of the Sawatch Range, a Laramide feature that was active in the late-Mississippian as well. The overall structural dip of the sedimentary rocks surrounding the range is away from the core. In the Leadville area this is to the east (Figure 1). Later tectonic activity associated with the northern end of the Rio Grande Rift, broke the section into a series of east dipping blocks, extending from Leadville to the Weston Fault on the east. The historic portions of the Leadville district are located a short distance to the east of the town, while the Mt. Sherman or Horseshoe district, is located in the topographically highest fault blocks at the summit of the Mosquito Range. Although the geology of the Leadville district is complex, the majority of the base metal silver production came from manto deposits in the Leadville Formation that followed pre-existing paleokarst features. An extensive erosional surface separates late Mississippian to Early Pennsylvanian rocks in North America and has been described at length by Palmer and Palmer . In the central Colorado area this paleokarst is typified by filled eaves, sinkholes, karst breecias and remnant karst towers [Maslyn 1976,1977]. Figure 2 is a map of the central portion of the historic Leadville district. Data for the map is from Emmon’s, et al., 1927 report with interpretations added by DeVoto . The map shows a northwest-southeast trending paleovalley extending into the area, the Breece Hill intrusive, and several mineral deposits. In the center of the figure is the Iron Hill Group, one of the two most economically productive in the historic portion of the district [Emmons, et al., 1927] and one that shows mineralization along paleokarst features. The geology of the area is further complicated by multiple north-south trending faults and intrusive porphories cutting the Paleozoic sedimentary section. Also note that ore bodies are found in three carbonate units, the Leadville and Dyer Dolomites and the Ordovician Manitou Dolomite. The single most striking geographic feature of the Leadville district, the paleovalley, was described by DeVoto  based on the pre-Pennsylvanian subcrop map. It clearly shows the Leadville Formation entirely removed in an area 3 mi (4.8 km) long by 1 mile (1.6 km) wide, exposing the underlying Dyer Dolomite. In the western portion of the paleovalley, the Dyer Dolomite is removed as well, with the Pennsylvanian section unconformably overlying the Devonian Parting Sandstone. The total amount of section removed by erosion is more than 250 ft (75 m). Note the strong southwest-northeast trends to the ore deposits in the Iron Hill Group south of the paleovalley. These features are interpreted from their morphology and from Emmons, et al.,  maps and descriptions to be mineral deposits filling caves formed in association with the paleovalley. In general, the ore bodies in the lowest stratigraphic units are closest to the paleovalley. Figure 2. Map of the central portion of the historic Leadville mining district. Note the paleovalley in the upper left portion of the map where the Leadville Dolomite has been removed by pre-Pennsylvanian erosion, exposing the Dyer Dolomite in the subcrop. The Breece Hill instrusive center is located east of the paleovalley. Ore deposits are shown in the dark and stippled patterns. From DeVoto  and [Emmons, et al, 1927]. Figure 3 is a cross-section through part of the Iron Hill ore deposits. Note the cave like shapes of the integrated ore bodies. In the map view (Figure 2), the ore deposits in the Iron Hill Group show their lowest stratigraphic development to the northeast, nearer the paleovalley. Similarly with the cross-section (Figure 3), the most extensive development in the lowest stratigraphic horizon is at the northeast end, closest to the paleovalley. Also note the multiple porphory intrusives dissecting the sedimentary rocks as well as the post-intrusive faulting. The presence of the porphories and the Breece Hill intrusive stock led early workers (e.g., [Emmon’s, 1886] and [Emmons, et al., 1927] to conclude that the ore deposits were hydrothermally emplaced. Later workers (e.g., [Tschauder, et al, 1990] challenged that hypothesis. Figure 3. Longitudinal cross-section through part of the Iron Hill deposits. Note the cave-like morphology of the ore deposits. From DeVoto  and [Emmons, et al, 1927]. The Sherman Mine is part of the Mt. Sherman or Horseshoe mining district, straddles the Mosquito Range, 10.5 mi (17 km) east of Leadville. With elevations that extend over 14,000 ft (4,200 m), the area is east of and topographically above the main part of the greater Leadville mining district. Mining operations continued at the Sherman Mine into the 1980s and good information is available on the geology and ore deposits, in particular see Tschauder, et al, 1990, from whom much of this section is derived. As with the other paleokarst systems in the Leadville area, the paleodrainage direction at the Sherman Mine was to the northeast. Using the current strike and dip of the sedimentary rocks in the area and the relative strike and dip of the paleocave fills, Tschauder et al., 1990, derived a paleodip to the northeast at the time of cave formation. Three integrated cave systems have been identified (Figure 4). The NI9-7, O23, and M16 systems are situated in an area approximately 4300 ft (1300 m) long in the north-south direction and 2000 ft (600 m) east to west. These cave systems show predominantly northeast trending development, as might be expected, following the northeastward paleo dip. Individual cave passage cross-sections reach up 65 square ft (6 square meters). The longest traceable passage reaches 1500 ft (450 m) in length. Thirty-four sinkholes intersecting cave passages have been identified, with at least 29 at the updip end of cave passages, presumably water input sites for the cave system during cave formation. These are shown by the solid circles in Figure 3. Figure 4. 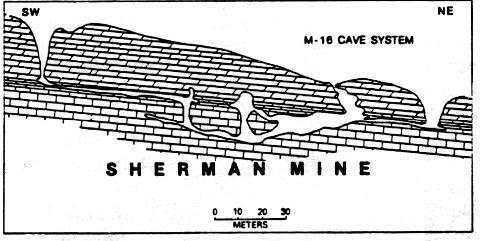 Map of the Sherman Mine showing three integrated paleocave systems. The solid circles represent sinkholes intersecting cave passage. From [Tshauder, et al, 1990]. Figure 5. 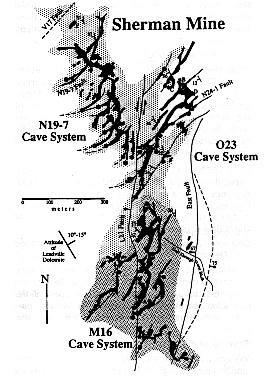 Southwest-northeast projected cross-section of the M-16 cave system. From [Tshauder, et al, 1990]. In cross section (Figure 5), the M-16 cave system, the southernmost of the three, shows a sinkhole input leading to an unconformity controlled passage developed along the contact of the Castle Butte Dolomite and Redcliff Dolomite members of the Leadville Formation. Two hundred ft (60 m) down the passageway, the cave drops to a lower level in the Redcliff Member for 100 ft (30 m) and then gradually rises to the unconformity, continuing along for another 100 ft (30 m), before terminating at another sinkhole. Along the way, two domes are encountered. All passage distances are from the projected cross-section. Figure 6 is a cross-section of one of the cave passages encountered while mining. Note the sharp contacts of the cave fill with the dolomite walls the passage. The cave is approximately 20 ft (6 m) high and extends almost equally above and below the Castle Butte-Redcliff Dolomite unconformity. 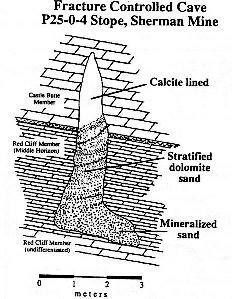 Tschauder, et al., 1990 (p. 328) in describing the cave fill state, "The upper portion is calcite lined, the middle is filled with stratified dolomite sand and the lower portion is mineralized (in part with detrital sulfide fragments)." Figure 6. Cross-sectional view of a fracture controlled paleocave at the Sherman Mine. From [Tshauder, et al, 1990]. Each of these factors will be discussed in turn. This is single most striking paleogeographic feature of the Leadville district (Figure 2). Based on the pre-Pennsylvanian subcrop map, it clearly shows the Leadville Formation entirely removed in an area at least 3 mi long by 1 mi wide. The total amount of section removed by erosion is more than 250 ft (75 m). The paleovalley drainage likely served as the master stream in the area during the time of the paleocave formation in the historic portion of the Leadville district [DeVoto, 1983]. This valley feature while uncommon is not unique. Valleys of similar depths are reported by Maslyn  in the Aspen area on the west side of the Sawatch Range and by Dings and Robinson  in the southwestern part of the range. DeVoto  interprets drainage in the valley to be from northwest to southeast off of the ancestral Sawatch Range highland. This direction would be away from the ancestral Sawatch Range. Pre-Pennsylvanian faulting of the Leadville Limestone is documented from the Aspen mining district [Maslyn, 1976] and from the Sherman Mine in the Leadville district [Tschauder, et al., 19901. Most of the latter have limited vertical displacement and show multiple episodes of activity. In places, these faults have influenced paleocave development and related surface topography. Quoting from Tschauder, et al., 1990 (p. 325), at the Sherman Mine, "Some paleokarst caves begin at dolines located where northeast trending arcuate faults change strike from almost east-west to about N 30 E in less than 50 m."
Since most of these faults are small, their initial effect on the paleotopography was probably limited. Later, with integrated karst systems development they were a major factor in sinkhole localization. Throughout the Leadville district the paleocave passage orientations are strongly southwest-northeast. Convergence zones for cave passages are the northeast ends of the passages, suggesting that the major water flow was to the northeast as well. In modern karst settings, sinkhole inputs to a cave systems are predominantly at the upstream end [Sweeting, 1973]. Figure 6 shows that most of the sinkholes are at the southwest ends of cave passages, indicating that the water flow direction was to the northeast. Modern caves with multiple horizontal levels commonly have the highest level towards the upstream end, with progressively lower levels beginning closer and closer to the outlets. Cross-sections of the paleocave systems in the Leadville district show the offsets of lower levels to the northeast, again suggesting that was the primary water flow direction. The Leadville area in the late-Mississippian was dominated by a single valley, draining to the southeast off the ancestral Sawatch Range. Areas north and South of the valley tilted to the northeast. The surface itself was gently rolling, intercepted by a number of sinkholes, whose location was controlled in part by small faults. Water entered the sinkholes and traversed multi-level caves, flowing from the southwest to the northeast. Cave Passages joined together in convergence passages at the northeast ends of the cave systems. Balleweg, K. J., 1990, Geology of the Orient limonite deposit, Saguache County, Colorado: Colorado Sch. Mines, Golden, Colorado, Geol. Masters Thesis, T3605, 218p. Beaty, D. W., Landis, G. P., and Thompson, T. B., 1990, Carbonate-hosted sulfide deposits of the central Colorado Mineral Belt. Introduction, general discussion, and summary, in Beaty, D. W., Landis, G. P., and Thompson, T. B., eds., Carbonate-hosted sulfide deposits of the central Colorado mineral belt: Econ. Geol Mon. 7, p. 1-18. Bryant, B., McGrew, L. W., and Wobus, R. A., 1981, Geologic map of the Denver I x 2 degree quadrangle, north-central Colorado: U. S. Geol Surv. Map I- 1163, 1:250,000. 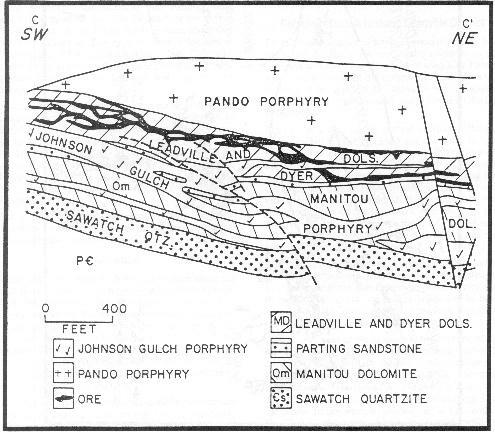 DeVoto, R, H., 1983, Central Colorado karst controlled lead-zinc-silver deposits (Leadville, Gilman, Aspen, and others), a Late Paleozoic Mississippi Valley type district in, the genesis of Rocky Mountain ore deposits: changes with time and tectonics: Denver Region Soc. Exploration Geol., P. 51-70. Dings, M. G., and Robinson, C. S., 1957, Geology and Ore Deposits of the Garfield Quadrangle, Colorado: U. S. Geol. Surv. Prof. Paper 289, 110p. Dorward, R. A., 1985, Sedimentation and diagenesis of the Devonian Dyer and Mississippian Leadville formations, central Colorado: Colorado Sch. Mines, Golden, Colorado, Geol Masters Thesis T-2897, 201p. Dupree, J. A., 1979, Stratigraphic control of uranium mineralization at the Pitch mine, Saguache County, Colorado: Colorado Sch. Mines, Golden, Colorado, Geol. Masters Thesis T-2255, 111p. Emmons, S. F., 1886, Geology and mining industry of Leadville, Colorado: U. S. Geol. Surv. Mon. 12, 770p. and atlas of 35 sheets. Emmons, S. F., Irving, J. D., and Loughlin, G. S., 1927, Geology and ore deposits of the Leadville mining district, Colorado: U. S. Geol Surv. Prof Paper 148, 378p. Luiszer, F., 1996, 1996 NSS Convention Geology Field Trip Description and Log: Nat. Spel. Soc. Guidebook, 1996 NSS Convention, Salida, Colorado. Maslyn, R. M., 1976, Late-Mississippian paleokarst in the Aspen, Colorado area: Colorado Sch. Mines, Golden, Colorado, Geol. Masters Thesis, T-1811, 96p. Maslyn, R. M., 1977, Fossil lower karst near Molas Lake, Colorado: Rocky Mtn. Assoc. Geol., The Mountain Geologist, v. no. I p. 17-25. Palmer, A. N., and Palmer, M. V., 1995. 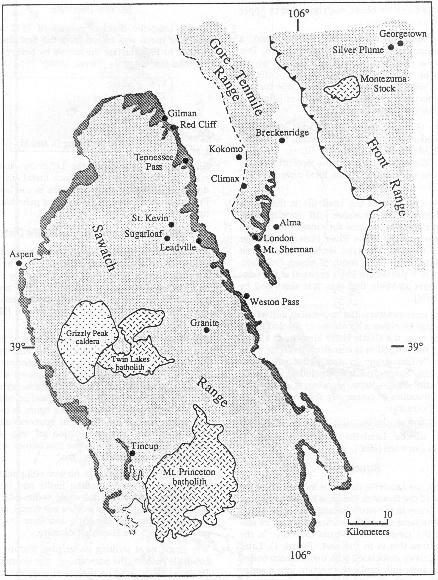 Kaskaskia paleokarst of the northern Rocky Mountains and Black Hills, northwestern S. A.: Carbonates and Evaporites, v. 10, no. pp. 148-160. Posada, J. H, 1973, Karst-related features and controls on ore mineralization in the Leadville Formation central Colorado: Colorado Sch. Mines, Golden, Colorado, M. S. thesis, Colorado School of Mines, Golden, Colorado, 94p. Radabaugh, P- E., Merchant, J. S., and Brown, J. 1968, Geology and ore deposits of the Gilman, (Red Cliff, Battle Mountain) District, Eagle County, Colorado, in Ridge, J. D., ed., Ore Deposits of the United States 1933-1967, Am. Inst. Min. Met. and Petrol. Eng., New York, p. 641-664. Sweeting, M. M., 1973, Karst Landforms , Columbia Univ. Press, N. Y., 362p. Tschauder, P- J., Landis, G. P. and Noyes, R. R., 1990, Late Mississippian Karst Caves and Bi-Ag-Pb-Zn Mineralization in Central Colorado: Part I. Geologic Framework, Mineralogy, and Cave Morphology, in, Beaty, D. W., Landis, G. P., and Thompson, T. B., eds., Carbonate-hosted sulfide deposits of the central Colorado mineral belt: Econ. Geol Mon. 7, 308-338. Tweto, O., 1968, Leadville District, Colorado, in, Ridge, J. D., ed., Ore Deposits of the United States 1933-1967: Am. Inst. Min. Met and Petrol. Eng., New York, pp. 681-705. Tweto, O., Moench, R. H., and Reed, C. J. Jr., 197 Geologic map of the Leadville 1 x 2 degree quadrangle, northwestern Colorado: U. S. Geol. Surv. Map I-999, 1:250,000. Here's a link to an article on how to recognize many paleokarst features.